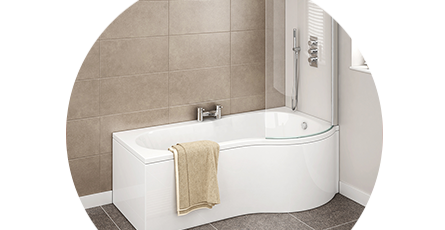 A P shaped bath is a curved, contemporary design which facilitates showering and bathing by offering more space in the tub. These shower baths are an excellent way of combining a luxury shower and bath in one stylish unit. P shaped baths and b shaped baths are the same thing; the different names come from when a letter p is turned upside down it becomes a letter b. Whether you want a b shaped bath or a p shaped shower bath you will find what you want here. At Victorian Plumbing, we believe in value for money and that's why we source the best quality acrylic p shaped shower baths at the best possible price. Shop our range below and improve your shower experience now.